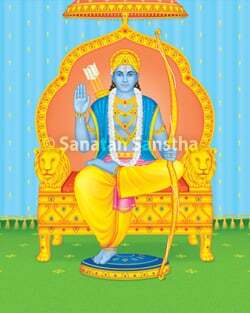 What is the real meaning of Ramarajya? The real kingdom of Lord Rama (implied meaning): Absolute control over the five sense organs, five motor organs, mind, subconscious mind, intellect and ego by Lord Rama (Atmaram – the soul principle) dwelling in the heart itself is Lord Rama’s real kingdom. Why did Bharat install padukas of Lord Rama on the throne instead of His idol? With one boon Kaikeyi got Lord Rama banished to the forest for fourteen years and with the other, she asked that Bharat be made the crown prince. Why should one chant the name Shriram instead of ‘Ram’? Chant the Names Rama and Shree Rama each for two minutes and record your spiritual experiences, that is note with which Name you feel pleasant or distressed.